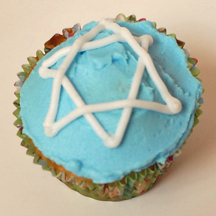 Making this Star of David cupcakes for Hanukkah is as simple as tinting icing blue and piping 2 triangles. What You Need: 1 cupcake (baked and cooled); icing tinted light blue; white icing (works a little better if you add some piping gel, but this is not essential); pastry bag (any type); round tip 1, 2 or 3. You could also just buy a tube of white writing icing or gel. This entry was posted on Tuesday, December 4th, 2007 at 4:00 am	and is filed under Hanukkah cupcakes. You can follow any responses to this entry through the RSS 2.0 feed. Responses are currently closed, but you can trackback from your own site.